This weekend J and I went to see The Book of Mormon at the Boston Opera House. The only thing I knew about the show beforehand was that it was written by South Park creators Matt Stone and Trey Parker, so I fully expected it to be foul-mouthed, irreverent, and funny. What I didn’t expect, however, was for this zany story of young Mormon missionaries proselytizing in rural Uganda to be sweet. Stone and Parker get away with lampooning Mormonism and offering a cartoonish caricature of Ugandan village life because the characters they create are essentially likable. Mormon missionaries Cunningham and Price are young, idealistic, and naive…but so is Nabulungi, the young Ugandan woman who is the first to accept a particularly warped version of traditional Mormon teaching. The degree to which Elders Cunningham and Price have been sheltered from anything but First World Problems is apparent the moment they arrive in Africa, and they never entirely lose their cluelessness, with one running gag focusing on Elder Cunningham’s complete inability to remember Nabulungi’s name even though he’s clearly smitten with her. The Book of Mormon lambasts Cunningham and Price for their naivety, but the audience can’t help but root for them. When faced with trouble, people can either curse or bless God, and The Book of Mormon demonstrates both approaches. One toe-tapping, wildly NSFW musical number, for instance, features the Ugandan villagers teaching the visiting Mormons a phrase they utter whenever things go bad, and while the missionaries assume the phrase means “No worries,” it turns out to be pointedly blasphemous instead. Both Cunningham and Price try to convince the villagers to find solace in God, but this approach falls flat when the previously-pious Price has an epic crisis of faith the first time he faces true hardship. Initially, the missionaries’ message falls on deaf ears because its otherworldly idealism is so far removed from the harsh realities of life. But because The Book of Mormon is a comedy, it cannot end with existential dread. Although Cunningham, Price, and their fellow missionaries travel to Africa with the intention of teaching the villagers there, of course they end up learning more than they’d anticipated. Mormons, it turns out, believe a lot of crazy things…but so do Christians, Muslims, Jews, and optimists of all sorts. 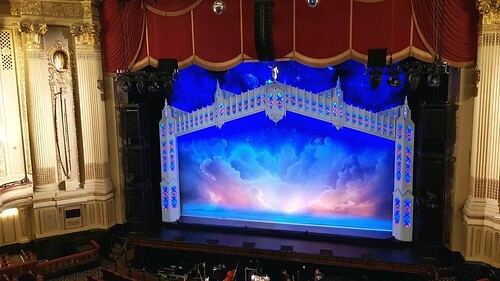 The Book of Mormon is a sweetly uplifting story–despite more than two hours of irreverent humor, crude jokes, and obscene language–because it suggests the metaphors underpinning religious faith are ultimately helpful and worthwhile if they lead ordinary people to treat one another more kindly. I don’t know if God has a sense of humor, but if he does, I’m guessing he’d approve that message. Monday was a gray and damp day, with thick fog and misty drizzle in the morning. For the first time in a week, it was cool enough for the dog and me to walk to the Place of Pines and back. Few dog-walkers were out because of the threat of rain, and it was too cool for bugs. There’s a solitary American wahoo (Euonymus atropurpureus) I see blooming every year near where the trail forks toward Puritan Road, just past Beethoven Street. 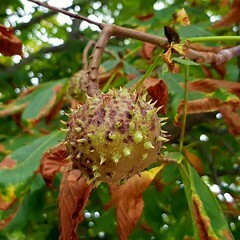 Right now, this shrub is done flowering and is forming green fruit that will in time ripen to red and burst. I stopped to take photos of these fruit in formation, but it was difficult given the paleness of the hanging globes and the lack of a contrasting background. I also photographed a solitary ghost pipe (Monotropa uniflora). 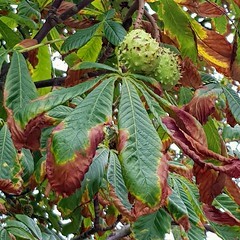 It was odd to see just one blooming, as they usually grow in clumps. But I know now to look for others: if there is one blooming, there are presumably more, and the first appearance of ghost pipe always comes as a surprise, a reminder that it is later in the year than I think. Mostly, these moist and steamy days are good for fungus and fern. There is a sensitive fern spontaneously sprouting by our back door, and dead stumps along the Aqueduct Trail are frilled with shelf fungus. 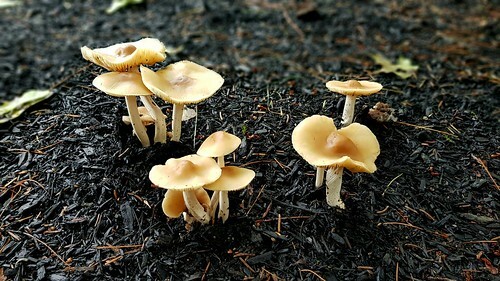 Today there is a stand of mushrooms where there were none yesterday: a bit of fungal magic brought about by weeks of almost-tropical humidity. 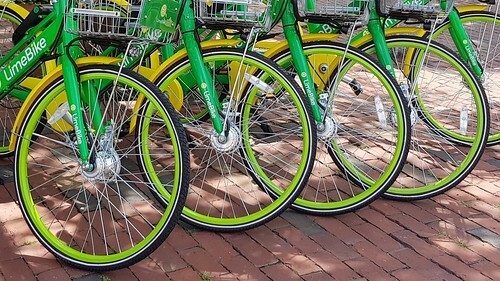 Dockless bike-sharing has come to Newton, Massachusetts, which means our neighborhood is dotted with eye-popping green and yellow LimeBikes that people can rent via a smartphone app and then leave anywhere, with no need to return to a central location. When the city’s LimeBikes were first deployed, they were seemingly everywhere, prominently placed in front of stores, banks, and City Hall: anywhere people are likely to congregate. Now that people have been (presumably) riding them, the bikes are less visible. Instead of being parked in prominent packs, they now have scattered singly: a bike here and there, parked in front of houses or at residential intersections where riders have left them for their next hire. This means my daily dog-walks and routine errands have turned into a kind of Easter egg hunt: where, in a word, will I spot another Limey? Although it’s been years since I’ve ridden a bike, I used to ride regularly. When I lived in Cambridge in the 1990s, my then-husband and I didn’t have a car, so my chief modes of transportation were my own two feet, the T, and my bike. Back then, I was young and fearless, riding in Cambridge traffic with nothing but a helmet and my own confidence to protect me. These days, I wince whenever I drive past a cyclist, their bodies seeming so fragile and small. But I remember from my biking days that my sense of personal space was different then: as long as I could find an open area to maneuver my bike and myself, I felt shielded from larger, more lumbering vehicles, zipping in between cars and looking out for my own safety since I (accurately) assumed no one else was looking out for me. Part of me would love to hop on a LimeBike: is it true when they say you never forget how to ride? But my older, creakier, more settled and sturdy self observes that I don’t have a helmet nor a definite destination: I have no need, in other words, to ride a bike when I can either drive or walk anywhere I’d like to go. Recently, LeBron James explained how having a bike changed his life when he was a poor kid growing up in Akron, Ohio: “If you had a bike, it was a way to kind of let go and be free.” I remember the rush of freedom I felt when I was old enough to ride my bike to the library, pool, or even a movie all by myself. Remembering that breezy freedom of being on two wheels, I wonder whether the sassy confidence of decades past would reappear as soon as I straddled a seat.